As a “struggling” artist myself, I rather despair when I see the sort of art that chainstore art galleries have to offer! I am completely in favour of buying a cheap and cheerful print from Ikea to brighten up a dull wall – what makes me incredulous is when a lot of money is spent on an “original” piece of art that has been mass-produced in the third world and shipped to the UK by the crateful, with most of the profit going anywhere but to the artist. I do understand that chainstore art galleries want to “play it safe”. It is, perhaps, not their job to challenge us with cutting-edge contemporary works – but, when what is on offer looks like cartoons for adults, it seems that the public are not being shown the best of what artists can do. It’s also true that people’s attention is taken up by very many other visual gadgets; the fact that many of us are glued to tablets, televisions and mobile screens means that we are less likely to seek out what is going on at our local gallery. It’s easier to buy art in a department store – a friend of mine calls this sort of art “Artzak”, like the “Muzak” we often used to hear in lifts: lightweight and, ultimately, unsatisfying. Please forgive this mini-rant; I hope it’s not jealousy that drives my strong feelings on this subject but perhaps that’s part of it! So let’s talk about a real art gallery, of the pop-up variety, that will be opening in Redditch’s Kingfisher Centre this month. Following the success of AiR’s (Art in Redditch) pop-up gallery in the centre in May this year, it’s going to happen again. During the ten days when the pop-up gallery was open in May, there were approximately 4,100 visitors; 37 exhibits were sold of a value of more than £2,000. This was not the main aim, however; the central purpose was to give local artists some exposure and for the public to gain appreciation of their work, and to encourage more people to find self-expression through the visual arts. This second pop-up gallery will be bigger and, it is hoped, even better than the first. The 23 local artists who showed their work in May will be joined this November by 16 new artists, making a total of 39 (lucky I can add up!). The gallery will open on the evening of Thursday November 20 and will be open every day for two weeks, including the weekends of November 22 and 29. On Monday December 1, work purchased during the exhibition can be collected and the event will close. Which unit the pop-up gallery will occupy within the Kingfisher Centre is still uncertain – but we hope it will be a large one. The event will be officially opened by the Mayor of Redditch, Councillor Pat Witherspoon; there will be late-night shopping on Thursdays as it is the run-up to Christmas and demonstrations of art and craft activities will take place. Mounting an exhibition involves an extraordinary amount of work – months of planning and discussion, getting agreement for the venue, vetting artists, organising the website, typing and printing labels, publicising the event, organising a rota of artists to run the gallery, preparing the space and putting up display boards, hanging and displaying the work, not to mention the nightmare of Health & Safety. And that’s just some of what has to be done. All of this is down to Malcolm Hall, former Redditch Mayor, and his amazing team of helpers. Of course, opening the exhibition and celebrating the event will be the icing on the cake. 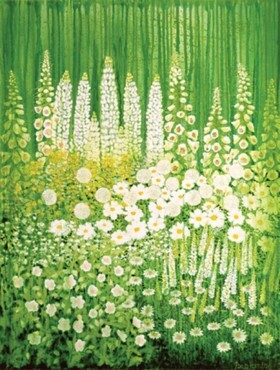 Pictured: White Garden by Paula Hamilton.